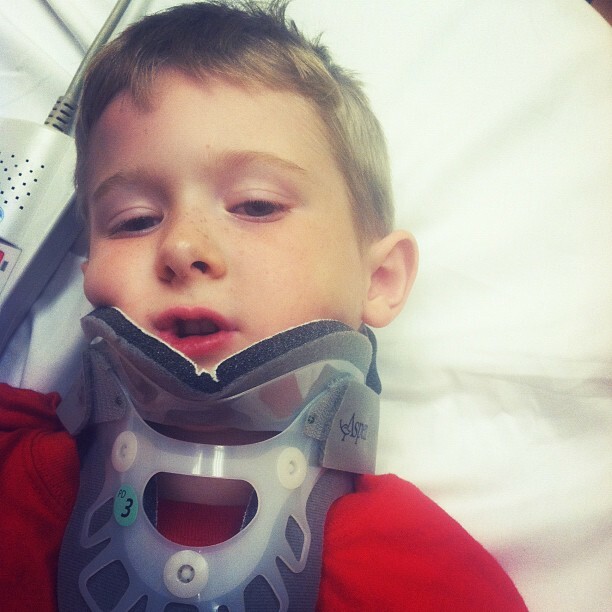 Our kid has a neck injury. Never fun, nor is a visit to the ER ever fun. Friday evening, E and his friend were playing with Izaiah and Z. Sean was in the garage, I was in the shower. The bro and sis-in-law were coming over before we all went out to eat. I get out of the shower and Sean rushes in, saying those dreaded words no mother ever wants to hear. 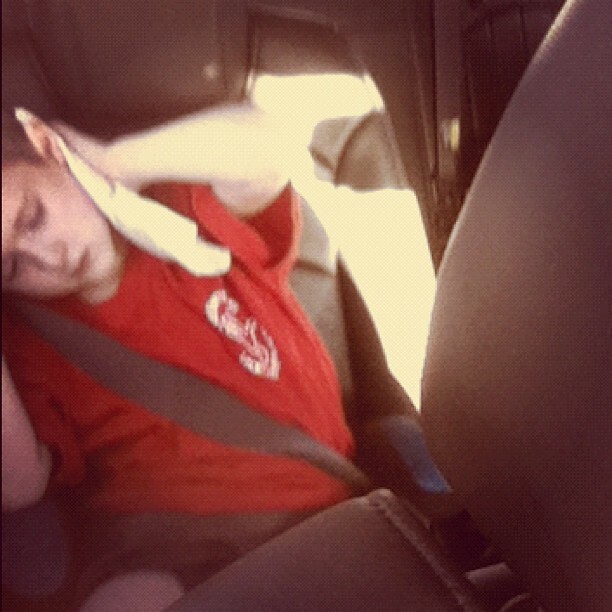 We’re Going to the Emergency Room – E is Hurt. Wait, I was just in the shower, now I am racing to get dressed. WHAT is GOING ON!? Downstairs I find E screaming in pain on the couch. Our family had arrived and went to look after all the kids. Apparently E and his friend head-butted on the stairs. E fell and hit his neck awkwardly on the bottom wooden step. He had hurt his neck and kept yelling the pain was getting worse. Into the car we go. We rushed to Children’s Medical Emergency Room where we were quickly taken care of. He was placed in a neck brace (cry!) and in a room. The doctors and nurses were all so nice. Since the hospital is for kids, everyone knew exactly how to talk to E and calm our nerves. Such a better experience then our last ER visit with E when he fell over and busted his head. After examination an x-ray was ordered. Then a CT scan. Again, the staff knows how to work with children. They rewarded him with stickers and a toy car for being so good while they took pictures of his bones. What a Friday Night. Thankfully there was no bone damage just a severe neck pull. We were sent home after 4 hours with a lovely neck brace and a few prescriptions for pain pills. 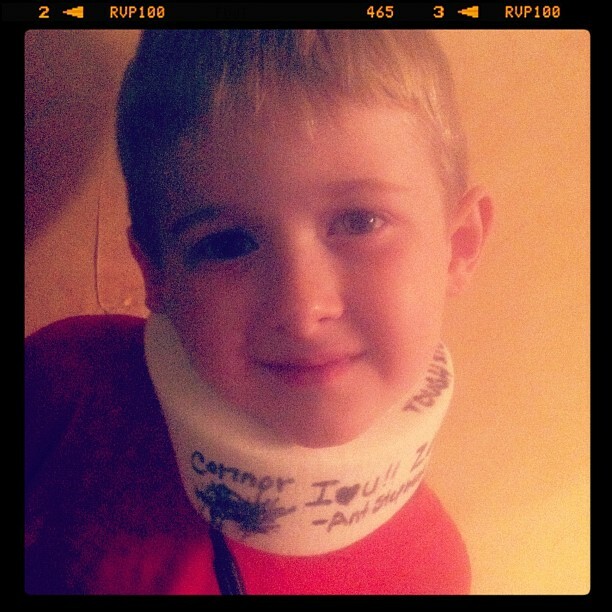 E thinks his neck brace is a cast, so when we returned home he had everyone sign it. He has spent the last 2 days sleeping, watching tv and playing on his iPod and doing anything to keep himself entertained that involves a couch. So thankful he is okay. Neck injury = FREAK OUT.